Billy Williams' Cabbage Patch' was bought by the RFU for just short of 5573 in 1907 and within three years it had hosted its first rugby international England v Wales in January 1910 in the newly expanded International Championship, the Five Nations. Now 100 years later it has become the largest dedicated rugby union venue in the world, seating 82,000 spectators, and in 2015 will host its second Rugby World Cup final. Twickenham is synonymous with the game of rugby and embodies the spirit of the game and its followers. Despite the intensity of modern-day competition, opposing fans of all ages mix freely in the stands. Banter is exchanged in the car parks and the bars, and after the drama of the game on the pitch, players shake hands while above them the colours of both sides mingle as the stadium empties. Post-match celebration and debate continue in and around the ground, but the dejection of defeat is mostly short-lived on a Twickenham evening. 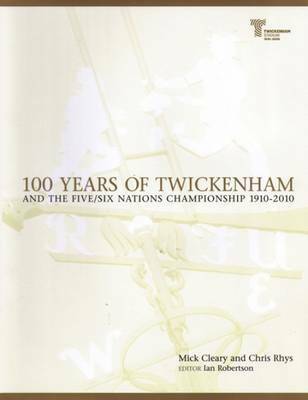 100 Years of Twickenham and the Five/Six Nations Championship tells the story of Twickenham's relationship with international rugby's oldest competition. Mick Cleary, rugby correspondent of The Daily Telegraph, provides the narrative, while leading rugby historian and statistician Chris Rhys provides an authoritative record of every game played in each decade of the competition plus additional records and tables. The tale begins in the early years of the championship, disrupted by two World Wars and to some extent marred by the absence of France for most of the 1930s. Nevertheless every period has its legends and this was the time of Ronnie Poulton, Wavell Wakefield and Alex Obolensky, George Stephenson of Ireland, Scotland's Oxford Four and Welshmen Wilf Wooller, Cliff Jones and Vivian Jenkins great players who dominated the game in their time. 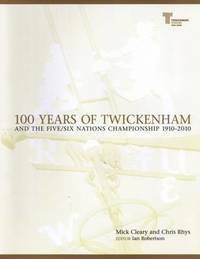 In the post-war era, the championship, France and the crowds returned to Twickenham. Grand Slams were won and lost at the stadium as the game's famous names paraded their talents in front of knowledgeable and appreciative spectators. Jackie Kyle was the inspiration for Ireland in the late 1940s; Cliff Morgan led the way for the Welsh, to be followed by the likes of Gareth Edwards, Barry John and J.P.R. Williams in the 1970s; Jean Prat and Guy Basquet brought France to the fore; Jim Aitken and David Sole enjoyed great moments for Scotland; Bill Beaumont and Will Carling led England revivals. In 2000 Italy joined the competition now the Six Nations and have already enjoyed their own special days and the talents of Diego Dom ed;nguez and Sergio Parisse. Over the past 30 years Twickenham has steadily evolved from a traditional rugby ground into a multi-purpose modern arena. But throughout all the changes it has managed to retain its special, indeed unique, atmosphere. A huge international event can still be a memorable day out for the family a tradition that Twickenham will carry with pride into its preparations for Rugby World Cup 2015.